On average, I don’t have the greatest luck with rental cars. Part of this could be I don’t travel as much as my TTS colleague, and so I don’t accumulate enough examples to dilute the sample set, swinging it my way. No, as of Thanksgiving, my hit rate on crapwagons is running at least even with the gems. To be clear, my dissatisfaction doesn’t fall to “the car left me stranded” or “the car burned to the ground” end of the spectrum. It’s doesn’t even splash into the toilet of “dynamically bereft.” And I can’t claim the worst of the worst were just bad eggs: A Nissan Rogue will always be a stupid, bloated quasi-Sentra wagon with a terrible rubber band transmission that has the personality of pocket lint. No. Regarding rental cars, my biggest gripe comes from a lack of tidiness. To wit: I don’t want to see other peoples’ funk in my rental. I don’t want to smell their cigarettes, or their weed. I don’t want to touch their coffee residue on the center console, in the cupholders, or spattered across the steering wheel. I’m not actually a clean freak, and I understand a lot of butts see a rental’s chairs. If anything, I’m more of a tidy freak. Tidy is good, and easier to achieve than a proper cleaning in the turn-and-burn world of major airport rental centers. Which brings me to Enterprise Rent-A-Car, and my most recent adventure, which took place in the San Francisco Bay area. Upon arrival, I mentioned to the nice gentleman in the oversized Target suit I would like – as a side dish to my reserved “large SUV” – something clean. I explained how the Ford Expedition I had recently rented from them in Portland was rather unkempt inside and out. Indeed, as that trip required shuttling clients around, I spent $8 of their money to have the big Ford cleaned a few blocks from our hotel. Suitman acknowledged by plight, and pointed me toward the three large SUVs they had available. Parked next to each other were a Dodge Durango and a Buick Enclave. I drove a Durango once in Los Angeles, and was once again reminded how I actually like FCA products as rentals. They drive pretty well, are generally well-optioned and have the toys like navigation and satellite radio activated, and look better than their Chevrolet counterparts. Next to the Dodge was the Buick… which was pretty much that. Farther down the row, my baggy-suited friend mentioned, was a Toyota 4Runner. Now, I don’t remember the last time I drove any kind of Toyota truck. I can’t actually remember the last Toyota of any kind I’ve driven other than our own Matrix XRS-6. A rental Camry Hybrid ten years ago? My cousin’s Previa 25 years ago? Who knows? But I’m predisposed to like Toyota trucks. Everyone uses and abuses them, from Top Gear to jihadists to my wife’s cousin’s family. I don’t love the new design language, including their watered-down Predator pucker faces. Looks notwithstanding, and after a quick check-over for filth and detritus, I figured what the heck. First, some basics. My white-on-graphite-cloth 2017 4Runner SR5 was the base model. It did have the optional third row seating – adding space for two miniature humans – which I immediately dropped and forgot about. The 270-hp, 24-valve, 4.0-liter V6 and 5-speed automatic combo is the only powertrain. A limited-slip differential is standard, as is 9.0 inches of ground clearance. I suppose those two things boost off-road prowess, but I barely noticed while traversing the occasional curb or dirt parking lot. Fuel economy? Sure. The graphics on Toyota’s Entune head unit were certainly dated, and the screen seemed smaller than my iPhone, but the system worked well enough. Every other control was Toyota-smart, and I had forgotten how cool it is to have a roll-down tailgate window. For the week I had the 4Runner, it was mostly just an appliance, moving me and occasionally one other person from site to site. It sat in traffic, it trundled along at 80 mph in the fast lane, it moved unnoticed through the towns. It neither squeaked nor rattled, and felt remarkably rigid for a body-on-frame truck whose basic design dates back to the dawn of the Japanese onslaught in America. I mean, sure, Toyota had 60-odd years to get it right. But they really did! The whole package, despite its refinement, still feels decidedly old-school. Think Tacoma four-door pickup with a metal bed topper, and you’re there. Most of my trip saw me in Marin County, just north over the Golden Gate Bridge from San Francisco. I lived here many moons ago, so – and while many things have changed – I’m basically familiar with the landscape. In the western part of the county are all the fun, twisty, beautiful roads you’ve read about forever in every car magazine. I learned to really drive on these roads, learned to really feel what a car can do, back before they were completely over-run with militant eco-terrorists bicyclists. These are my roads. 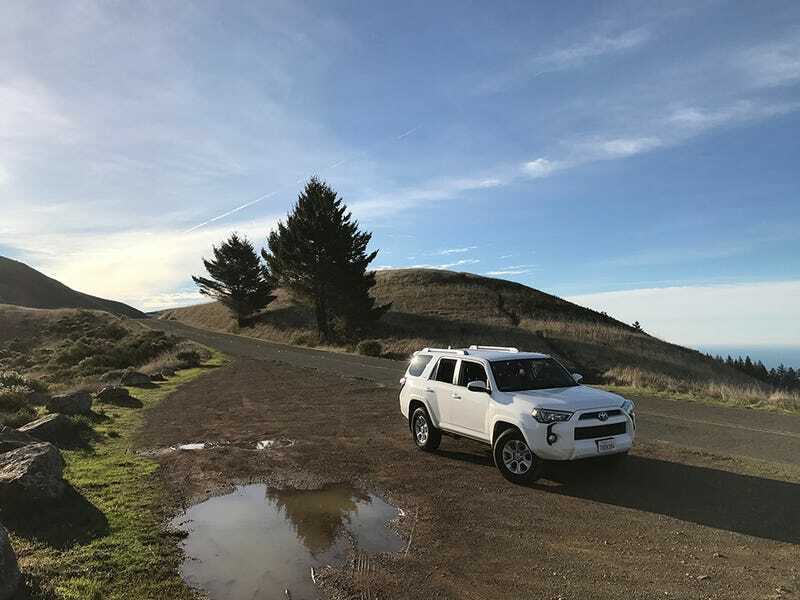 When shifted manually – third gear seemed the best compromise – the 4Runner proved to be a surprisingly willing accomplice on the twisty mountain roads, heading both up and down. The engine was kind of wheezy unless given the full boot. However, no doubt part of its nimbleness is due to the rear-wheel drive configuration, which brought with it fairly responsive steering and a seriously tight turning circle. I don’t know what the weight distribution is, but I’d be willing to bet a nickel it’s better than its four-wheel drive siblings. Turn-in wasn’t bad at all, body roll was pretty well-controlled, and the tires really only complained when you were being very silly. For reasons I won’t go into here, I generally reserve some kind of large SUV for my business trips. Many of those SUVs are trying to be a tall version of something else. The Grand Cherokee Limited in Los Angeles was trying to be a Chrysler 300C. The aforementioned Rogue wanted to be a dumpy Sentra. The Expedition – stuffed full of EcoBoost – went fast but didn’t turn or stop particularly well. Its aspirations remain a mystery. The 4Runner knew it was a small truck, and was happy about it. It accepted its roots, and thus its role. Sure, you can option a leather-lined, automatic-everything 4Runner with extra bling and powered running boards. But this wasn’t that truck. It was the basic model, and in the basic model of any vehicle you can clearly see how good or bad are its bones, its core. Did the manufacturer nail the basics? In this case, the core is fantastic, the basics are spot-on, and I very much appreciated its honesty. The 2018 version of my white 4Runner SR5 pushes $38,000, but that includes four-wheel drive (because of my local market) and navigation. It does not include seat heaters, but maybe the cloth seats render that superfluous? (They do not.) To get seat heaters, you have to move up to the 4Runner SR5 Premium. To get blue or red paint – you know, an actual color – and the dark beige interior (instead of graphite) you have to add the $1,500+ sunroof and running board package, pushing the bottom line over $40,000. While I’m not mad about the mandatory options, at this point I (typically) lost interest due to the vagaries of modern-day option package and color constraints. At forty-large there are a lot of other cars out there, and many of them are SUVs. But none of them are a Tacoma station wagon. It’s just a good truck. And if that’s what you want – and I think you might – I cannot recommend the 4Runner enough.